- Refill your summer planters with specialty branches available from your local garden store. You can also buy 4 inch cut tree limbs and glue pine combs and boughs of holly, and surround the base with evergreen branches. - Hang a wreath or other item on the front door. Wreaths can be purchased from any garden supply store. If you live in an apartment, you can use a smaller wreath. If building regulations prevent you from placing a permanent nail on the door, you can overcome this by hanging the wreath or other item on a festively coloured or white silk ribbon which can be strung over the top of the door and attached from the top or inside of the door (depending on the weight) with adhesion of the ribbon using tape or glue. Instead of a wreath, a simple red bow can be attached without any muss or fuss (no nails required!) by using tape. (Note: For condominiums, always check your condo rules and regulations before decorating doors and balconies as these areas are considered part of the building's "common elements"). - Swag garlands on fences and coil garlands on pillars or posts to gussy-up your entrance area. - For those with a larger than average decorating budget, hire a company that provides a turnkey decorating service. In Toronto, Christmas Décor Toronto will "design, install, service, take down and store your holiday decorations" with lights galore. The complete package starts at about $1,000. 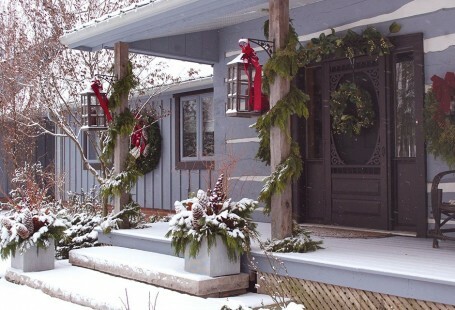 Below, an image of a house's exterior entrance completely decorated by Sheridan Nurseries. The effect is sophisticated with one colour scheme (green) and not cluttered. In Toronto, my go-to place for seasonal decorations is Sheridan Nurseries. All their locations carry a wide selection of supplies for holiday urns, wreaths, ornaments and even fresh-cut and live trees. Sheridan also offers a custom design service. Note the three wreaths hanging: one from the front door and the other two on each side of the door. Although this house showcases all of the ideas listed above, you don't need to do all of this work to achieve a holiday décor effect. By choosing just one of the ideas (planters, wreaths, ribbons or garlands), your home will instantly be in tune with the magic of the season! Image courtesy of Sheridan Nurseries. 2. Reinvent Décor: This involves imagination and a whole lot of fun! - If your home doesn't have space for a tree or you are concerned about using one due to environmental considerations, why not make your own "tree" on a wall! Select ornaments and affix them to the wall in the shape of a tree. You can also use ribbon, twine, thin garlands or assorted coloured or white fairy string lights to outline a tree (or another seasonal symbol) on a wall and fill the empty space with ornaments, coloured buttons, flowers, or whatever you desire. Whichever festival you celebrate at this time of year (Christmas, Hanukkah or anything else), use these guidelines to create symbols representing the tradition. - Holiday ornaments aren't just for the tree. If you have chandelier-type lighting (any light fixture that has arms will work), hang ornaments from them by attaching white silk ribbon. 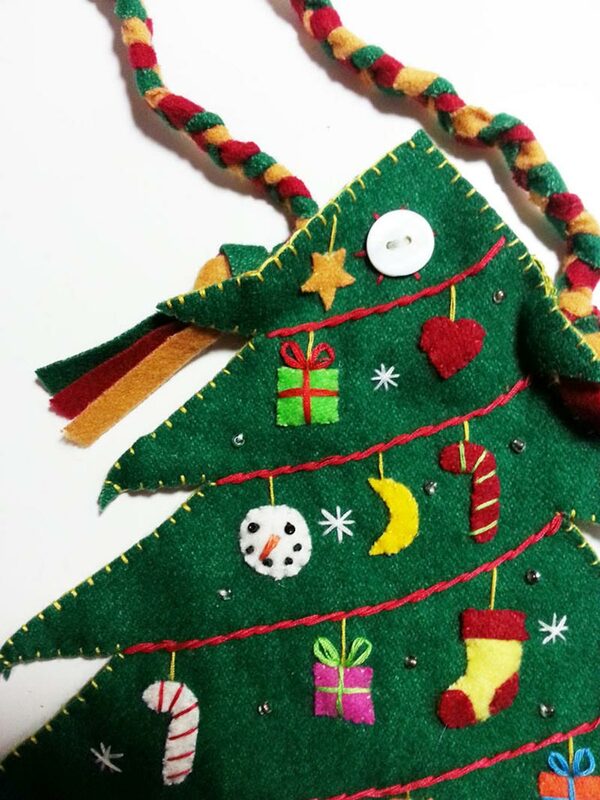 Below, an example of one-of-a-kind handmade felt appliqué ornaments, pillows, stockings, wreaths available from Little Handcrafts, a vendor at the Vancouver Christmas Market. Image courtesy of the Vancouver Christmas Market. 3. No Paint Required (not on the walls, at least): In contrast to the post I wrote on decorating for spring, I do NOT recommend embarking on a wall painting project using seasonal colours. This will beg a repaint right after the season is over. The only exception would be if your place is in desperate need of a fresh paint job and you would prefer to entertain with a fresh coat applied of the existing colour. If you are arty and enjoy painting, art stores often carry seasonal wood objects that can be creatively adorned with paint and other decorations. If you are even more ambitious (and have the space and/or an empty wall), buy a large canvas from an art supply store and paint it yourself with a tree or other symbol of the holidays (for example, divide it into 4 sections and paint each section with a different colour) and frame it with fairy lights. 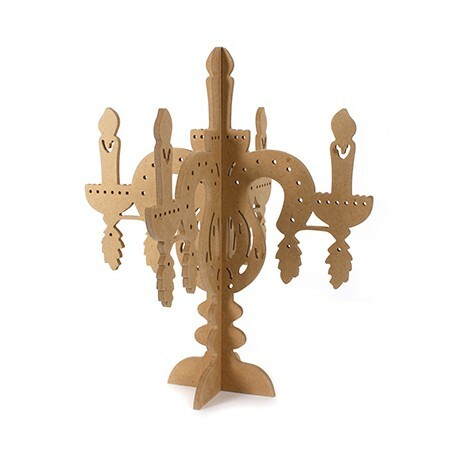 Below, a Wooden Christmas Candlestick from DeSerres can be painted and ornamented for placement on a mantel or a windowsill. 4. Holiday Servings: If you're planning a get together and do nothing else, get everyone in the mood with colourful plates, glasses and napkins. These don't have to be cheesy and cheap. Just find timeless, classy items with the colours that channel the theme of the holiday you are celebrating (for example, red or green for Christmas, blue for Hanukkah). Many china and gift stores carry a wide variety of holiday themed serving ware. The best places to find holiday themed crockery and table decorations are local annual Christmas markets including the Toronto Christmas Market and the Vancouver Christmas Market. 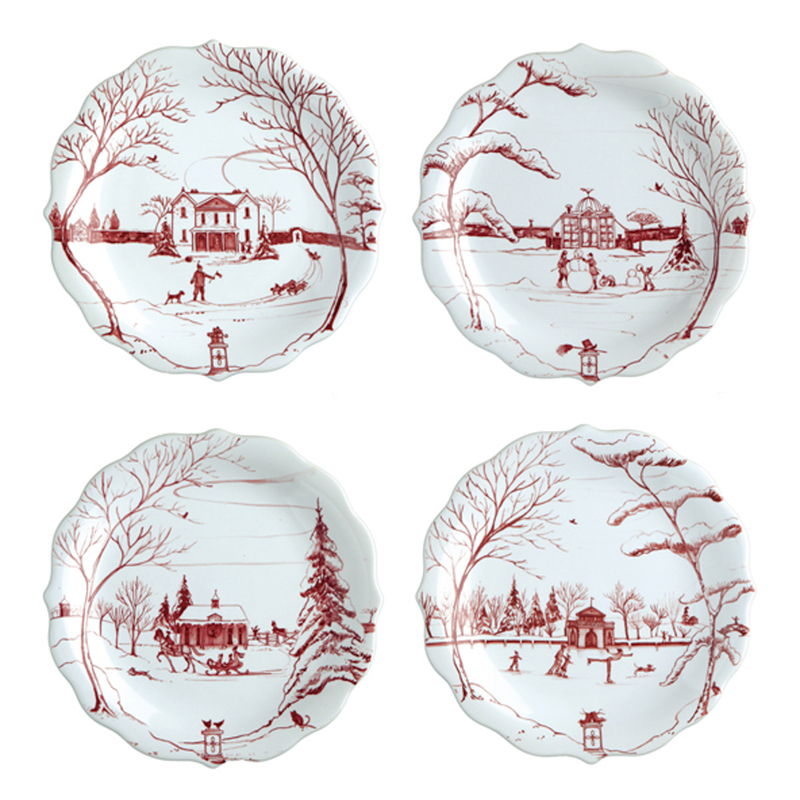 Below, plates from the Juliska collection, available online at William Ashley. Image courtesy of William Ashley. 5. Bake Cookies: Fragrance is used as a decor accent and candles or sprays work wonders to create an atmosphere. But did you know that freshly baked cookies are the fragrant choice of many home stagers and realtors for an open house? We're not talking about buying cookies and serving them. This is all about quick baking at home. Whether you use ready-made cookie dough and slice it up or whip up a batch from scratch, it doesn't matter. Nothing works as well or is as inviting as the sweet and heavenly aroma of freshly baked cookies just coming out of the oven. If you do nothing else this holiday season, make sure to do this one thing to get your home ready right before you receive guests. The scent of cookies has an amazing affect on the human psyche as it makes people feel "at home". 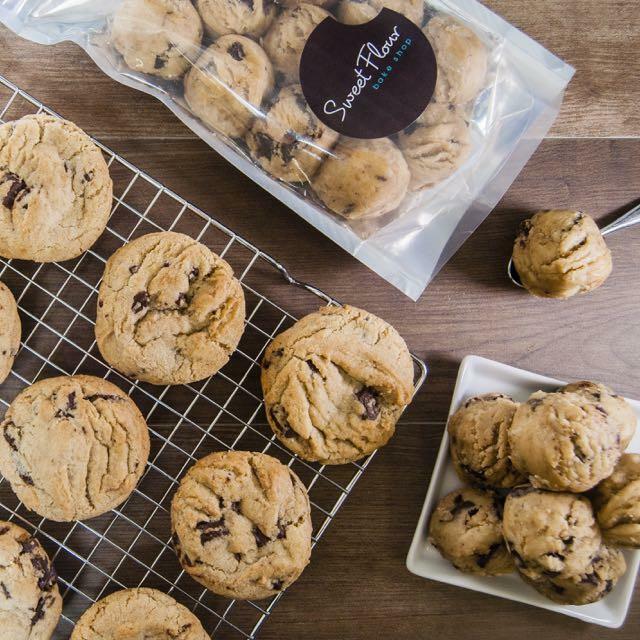 Check out Sweet Flour which sells Dough to Bake in 5 flavours (Chocolate Chunk, Oatmeal Raisin, Butterscotch Toffee, Peanut Butter Chocolate Chunk, Oatmeal Chocolate Chunk). The frozen dough is available online for local shipping in the Greater Toronto Area or have a freshly baked box delivered to your door across Canada. Perfection! Image courtesy of Sweet Flour. These 5 simple and cost-effective décor refreshes are cheerful ways to make your home more seasonal not only for family and friends, but also for your own enjoyment! Winter brings its own special atmosphere and is a darker, colder period outside which means we need to ensure we're doing what we can to create a brighter atmosphere indoors. It's aesthetically pleasing and soul-satisfying to bring the holidays home. To learn more about the products featured in this article, visit Christmas Décor Toronto, Sheridan Nurseries, DeSerres, Toronto Christmas Market, Vancouver Christmas Market, William Ashley, and Sweet Flour. Researched and written by Namrita Kohli, student in the Interior Decorating Certificate Program, George Brown College.